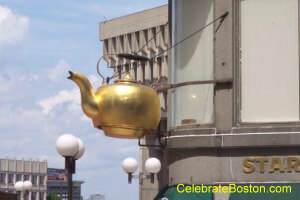 At Court & Tremont Streets (Government Center) hangs the giant tea kettle "sign" of the old Oriental Tea Company. This huge tea pot was manufactured in 1873 by a company called Hicks & Badger. The sign spent many years on the south side of Scollay Square, and was moved to varying locations in the area as buildings were torn down. The tea pot was a famous tourist attraction for many years. The reason is due to a huge publicity stunt. 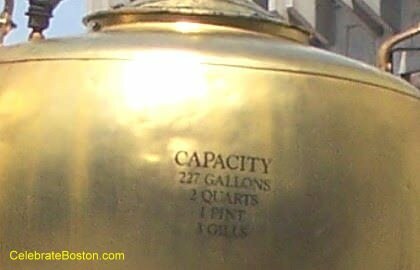 On January 1st 1875, a contest was held to guess the capacity of the kettle, and Boston's Sealer of Weights & Measures officially measured it. More than 10,000 spectators filled the square that day. Eight boys and a tall man had concealed themselves inside the kettle and appeared before measuring started, building excitement for the event. A total of 13,000 guesses were submitted, that were quickly organized and sorted. Each measure poured into the kettle was carefully checked by the city's inspector. A judge was present to observe the process to ensure the contest was fair. A large blackboard was updated after each measure, and it took more than an hour to fill the pot. At 1:05 pm, the closest guess was announced, and a great cheer came from the crowd. The tea kettle's capacity is two hundred and twenty seven gallons, two quarts, one pint, and three gills. Eight people that participated in the contest had guessed to within 3 gills of the above quantity, and were declared winners. The winners received one-eighth of a chest of tea, or about 5 pounds each. The tea kettle contains an apparatus within it that produces steam, and in winter it resembles a giant steaming pot of tea. The kettle is an excellent advertising tool, having outlived the Oriental Tea Company by many years.